My house is in shambles but my life is perfect. The shambles are boxes stacked everywhere! In the living room, in the dining room, and in the bedrooms. But on the other side of that I get to pack up my apartment to move into our very first house! As I’ve said before we’ve moved multiple times since me and Tyler been together. It has been five times in six years, which after looking back it is crazy, at the time it was a little adventurous to be onto the next place. Now I’m very excited though to have a house of our own to be able to make it our own and able to change things that we want to change. The best part will be having a stable place for our daughter. A girls dreams can come true. As always I’m apologizing for not writing because I’ve been busy. Busy making sales, busy making new products, busy completing orders busy packing up the house, busy being a mom. All good busy things unfortunately that puts this blog to the wayside which I know it shouldn’t and I’m working harder to keep on track. I do want to share with my recent selling products. I have been making bibs. And it’s funny because these Bibs are not my style but people love them and I love them now that I’ve made quite a few. They are very functional I like how they work. The bibs are a Pull Over style and they are super cute, I picked out some really cute fabrics to work with it. And I’m glad to be able to do it obviously, I’m happy every day that I can make something for someone else it’s me being able to share my art. And I want to share that with you here’s my bibs I’ve been creating there’s a mix-and-match said there’s also an individual sets where you can pick what you would like and maybe I can bring some cute clean ups your way. So even though my house is in shambles I’m still able to create and enjoy the happiness with my daughter and the love with my husband. I’m so thankful to have the life that I always dreamed of. And I am very excited to look forward to this next chapter in our lives. Before I left for vacation this week I made a few crafts for my Etsy shop Adalynncrafts. Let’s start with the Dreamcatcher, I love this. It is a large green dreamcatcher made from hand spun yarn. I make each by hand, crocheting an original pattern. With crochet leaves to match hanging from it. For more details check out my listing. Next I made some cloth napkins. These are great for every day use or if they match your special occasion theme. They are made from 100% cotton material. Each color has its own designs and patterns. These can be ordered in mix and match sets or in sets of all the same pattern. If you would like to see more detail check out my Etsy listing. Because my shop was closed while I was off celebrating my 30th birthday I wanted to share a discount with everyone. Everything in my shop is now 30% off!! Alright let’s get into it. First step is getting your fabric. I purchase 2 yards of each fabric (terry cloth and fleece). You can used recycled items like old towels and old flannel pajamas but as I make to sell, I buy new fabric. 🤩 2 yards is enough to make ten, 12×11 inch unpaper towels. Here I have two projects cut out because I like make things easy and get the most done at one time. Now we need to cut the fabric into squares. I give myself a quarter of an inch for sewing edging (a little more in the edges). I measure and cut ten 12.5 inch squares out of the terry cloth and the fleece fabric. Once all is cut I start the pinning. In sewing there is never too much pinning. 📍📍📍📍📍 Pin the right side of the fleece to the right side of the terry cloth. I pin all the squares then get into the sewing. This helps the process go along more efficiently rather then pinning one square at a time. Let’s begin sewing! Sew around the edge of the fabrics leaving yourself 1-2 inch gap unsewn to turn the fabric right side out. This is best to start in the middle of a side versus in a corner. Also fun tip with the corners, if you trim them like shown and use a pen or stick to poke the corners out they are more defined. After all the squares are sewn, turn right side out and pin where you left the hole. Sew 1/4 inch seam around the square. And you will sew a diagonal line from one corner to the other to help the towel keep its shape over time. Our last step is adding the snaps. For this I use snap pliers, piercing tool, and plastic snaps. First you are going to create holes in the fabric for the snaps to fit in to. After you pierce your fabric you can insert the snaps and use the pliers to secure the snap. I put 4 snaps on each towel so all the towels can be snapped together. You just need to remember to have the opposite snaps on each side so they can snap together. Now the towels can be rolled and placed on a paper towel holder or they can stand on their own. These are machine washable, I recommend having them all unsnapped while washing to prevent tangling. You can also skip the last step (no snaps) and keep the towels folded in a drawer or a basket on the counter. They are great to use in a variety of ways around your house. What eco friendly or reusable project have you created? What other paper products have you been able to replace in your house? Thanks for joining me and have a CreativeDay. I’ve made these a couple different ways, with different types of fabric. Today I am going to show you how I make bags with a cotton outside and waterproof fabric inside. I can make two bags out of a fat quarter. For the inside I use ProCare Fabric, which I buy from a wonderful Etsy shop Laminates. (She delivers quickly and has a great selection of fabrics) The ProCare fabric is food safe and makes the bags waterproof on the inside. I began by cutting each fabric into two 8 inch squares. After cutting, match the wrong side of the cotton fabric to the rough side of the ProCare Fabric and fold over the top. You will place the Velcro here and use a clip to hold in place. Now we can start sewing. Sew on the edge of the Velcro. When you are doing the top side go across the length of the fabric so the edge is completed. Match the cotton fabric right sides together and clip to began sewing the bag edges. I love doing small projects in between the big ones. Today I want to share my quickest project I do. A Stretchy Baby Headband. I can do these in any size really, but they are more popular for the little ones. I make it with a bow, or with a flower. To start I decide how big I want my headband then measure out the rubber bands. For this let’s make a Newborn, which is 11-12 inches. Lay out and measure the rubber bands. These are stretchy so they do not have to be perfect. Next step, is to start crocheting. I use a single stitch, and stitch half of the rubber band (3 single crochets). And continue 3 single crochet on each rubber band to the end of the row. Once I get to the end of my row, I single crochet down the other side of the rubber bands, and then attach with a slip stitch. Lastly we need to attach the bow. I tie into the rubber band where we ended in the headband and weave in the loose ends. Tying the bow on, ensures it will last longer with those little hands grabbing at it. 😊 The easiest way to weave in the loose ends is with an embroidery needle. We have completed a beautiful little stretchy headband. 👏 I ended up making mine bigger to fit my toddler since she woke up while I was making this one. And now you can see it in action. I love crafting and have since I was a child. My favorite crafts are crocheting and sewing but as you will see I adventure into other crafts as well. I have been crocheting for 10 years and sewing for 15….😳 yikes, where does the time go. My love of crafts comes from my mother and Gramz. They both taught me at a young age to be crafty. I still remember watching my grandma sew on her old machine that folded into the wooden table. (Aww nostalgia moment 😊) I was taught to crochet from a wonderful and sweet coworker when I was in college. I was watching her one day and she offered to teach me and I haven’t put down the needle sense. Today I make handmade gifts that I find useful and comforting in my own home. Along with recycled and eco-friendly items as I try to stay as eco friendly as possible, but don’t worry I’m not to much of a snob about it 😁♻️. If you have any questions please message me and I will get back to you as soon as possible. I primarily sell on Etsy but recently opened an Amazon Handmade shop. I have enjoyed opening each shop. Each has come with its own learning experience, but both offer me the opportunity to be creative and share my art. 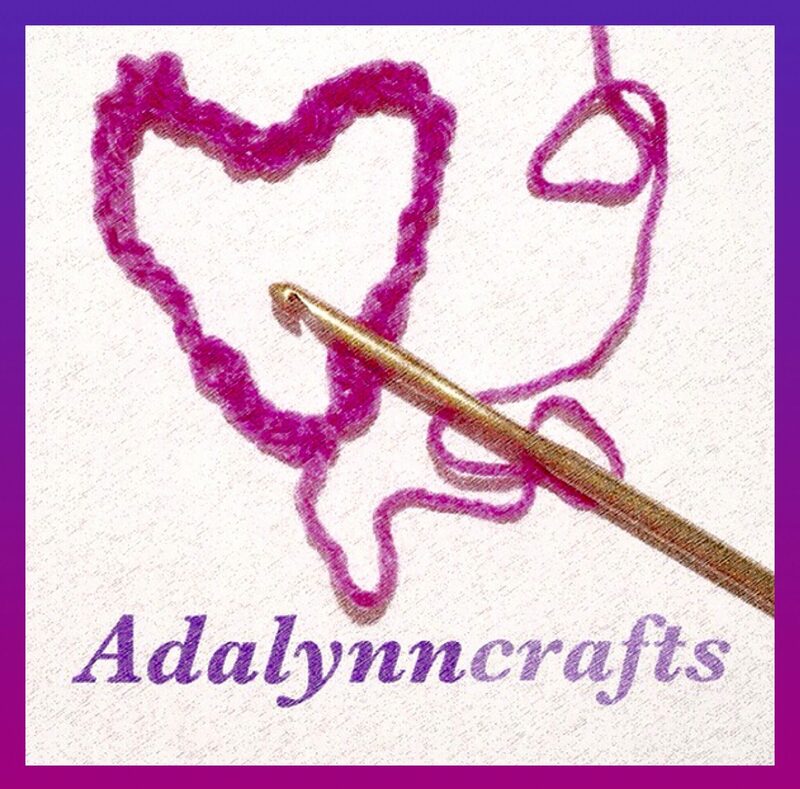 My goal will be updating weekly about what crafts I am making…maybe trying my hand at writing a pattern or two and just sharing my love of crafting. I usually do craft shopping once a month and will bring you along for that sometime as well. I would love to hear your crafting stories. What got you into crafting and what your favorite crafts are.